For the last maybe 5 Fridays before Y's RSGK class at Treston, we always have our lunch in the Makati or BGC area. We used to come home first after school, eat lunch then go to RSGK but there have been road works in our area and it's always traffic! So we've been eating out every Friday! 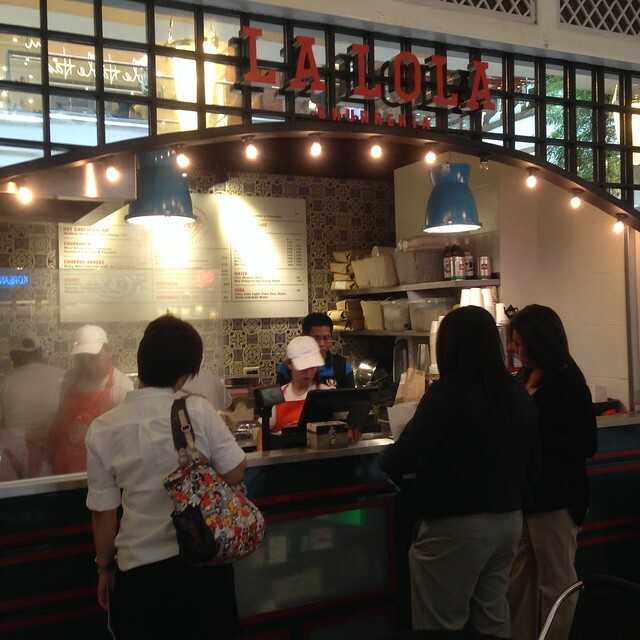 I first heard of La Lola from BOS. Siya yung hindi lumalabas but he always knows what's new. Heehee! I also heard that it always has a line so when Y and I passed by one Friday without a line, I took the chance! I got the smallest size which was 6 pieces (I think?). It was still too many for just 1.5 of us. Heehee! She ate one. I had three. We took home the two. Hehe! 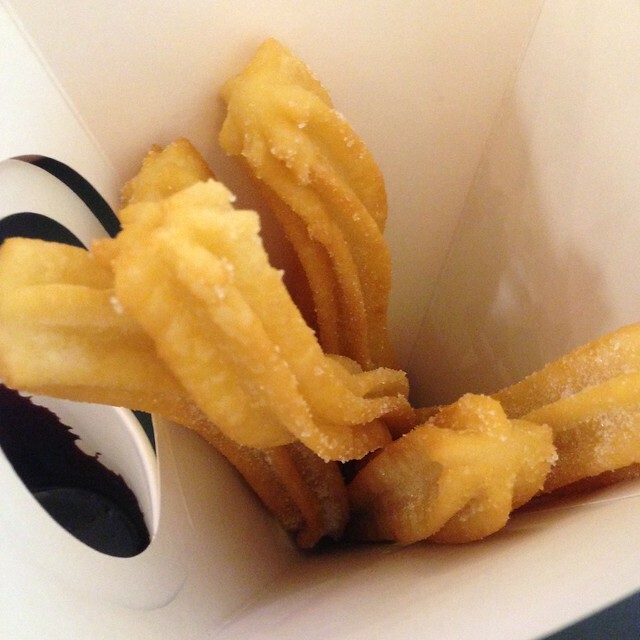 Deep fried churros dipped in chocolate. 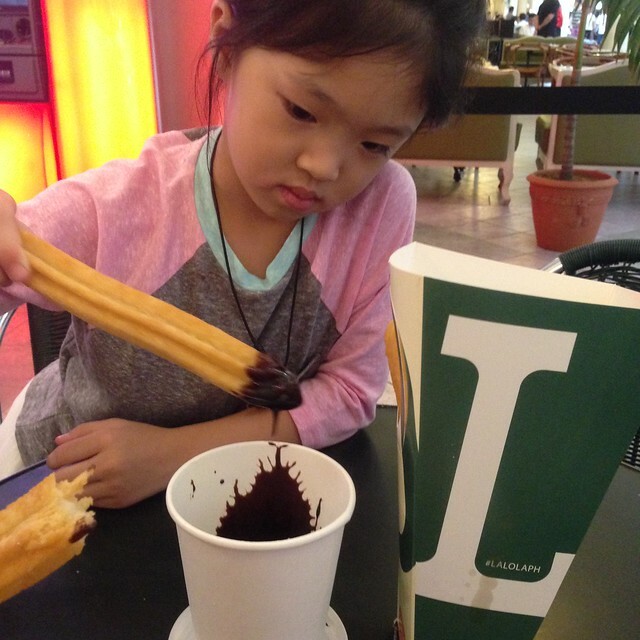 I like that the churro is crispy but I find the chocolate too sweet. Nakaka-umay. 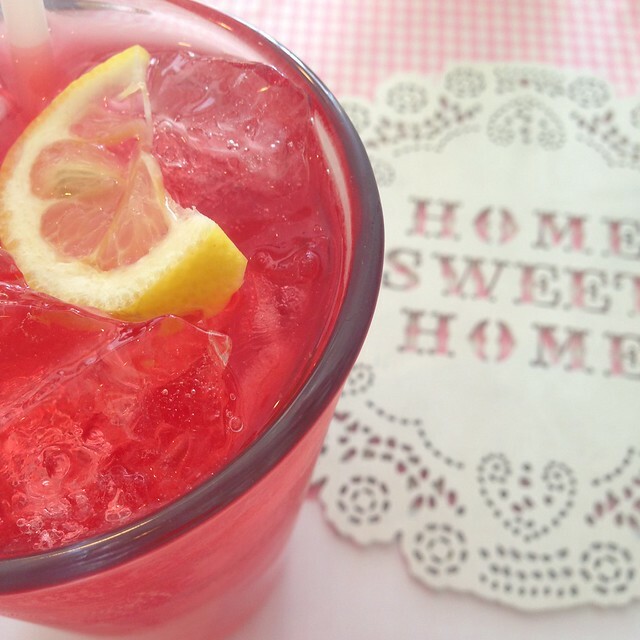 One small order is good for 3-4 persons already. Will I order again? Maybe. Will I line up again? No. But if there's no line, I might eat it again. I've also been hearing a lot of Sarsa from friends. So when my best friend and I were meeting for our pre-birthday lunch (our birthday is one day apart), I suggested that we try Sarsa. 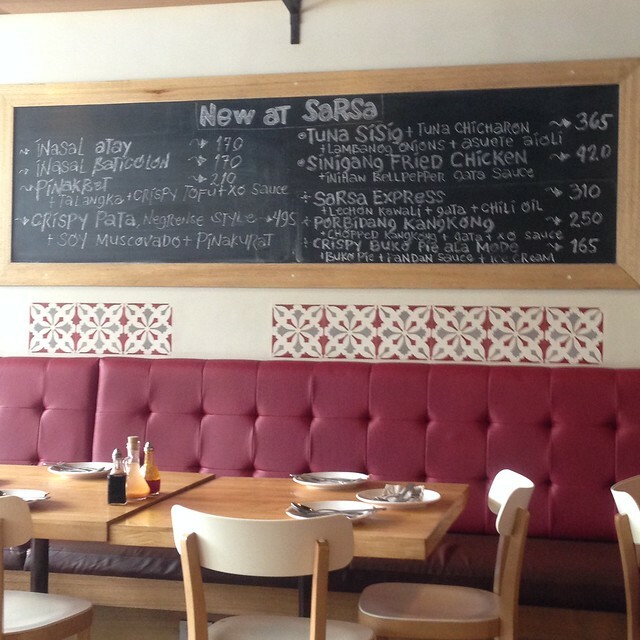 Sarsa serves traditional Filipino and Negrenese dishes. I arrived just in time before the lunch crowd. Something to munch on while you wait. 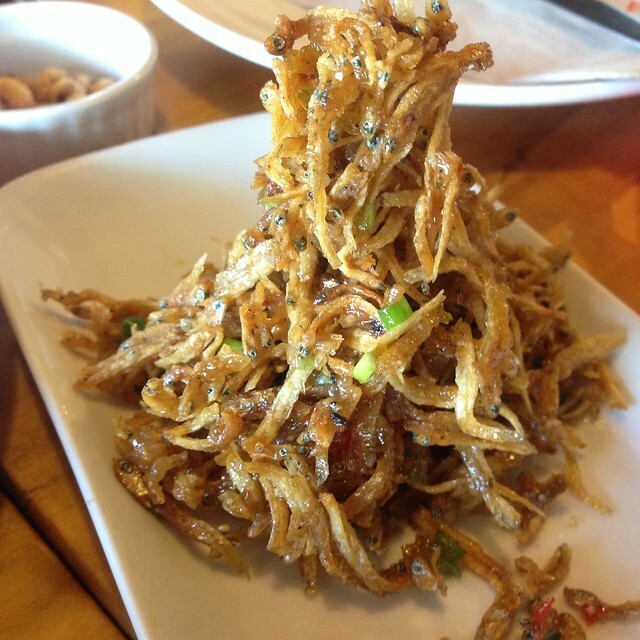 Crispy Dilis, Php120. This was addicting and so good! 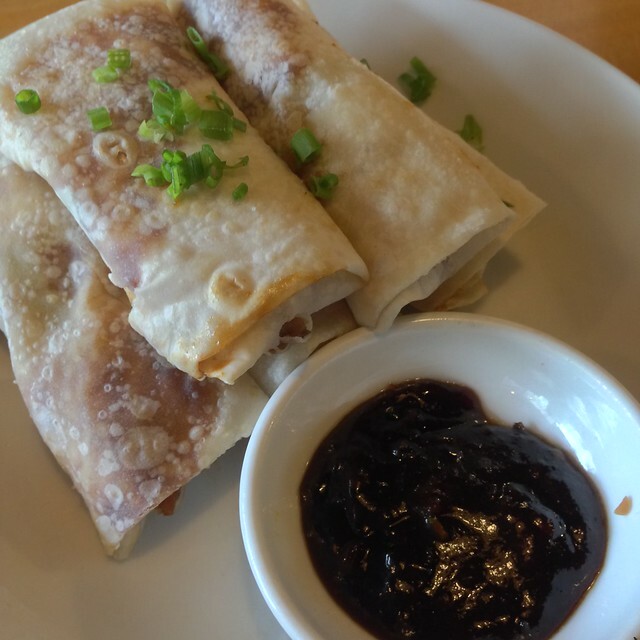 Pritchon Pancake, Php270. The server suggested this one. Some kinda like Peking Duck. This was also good. 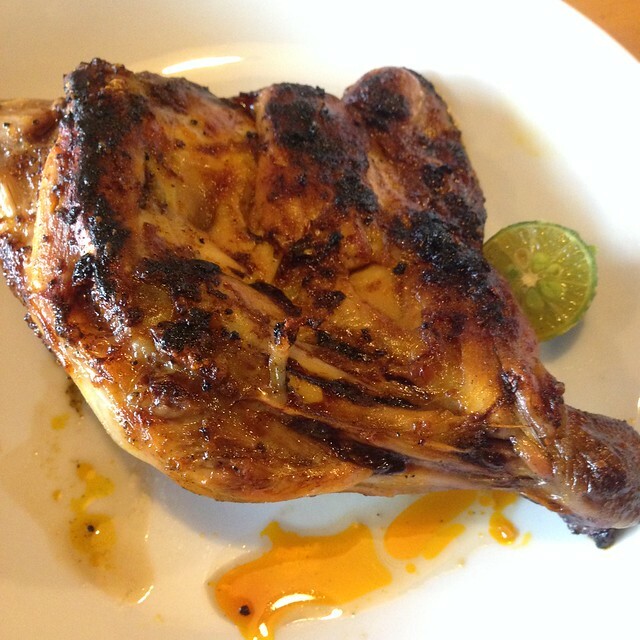 Chicken Inasal (Pa-a part), Php175. I ordered this for Y. She finished the whole thing. For a little girl who like her fried chicken, if she was able to finish this one, it means it's good! Heehee! I was able to try it, it's really good! One of the best inasals I've had. 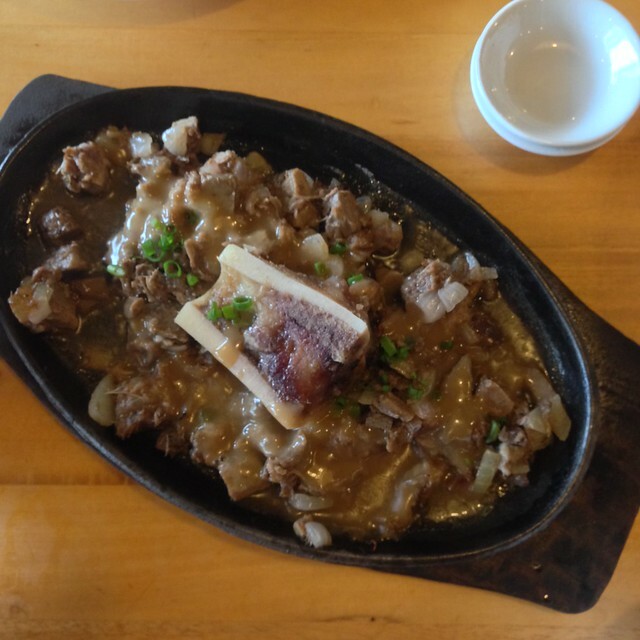 Sizzling Kansi (Sizzling Bulalo), Php380. I read a lot of food blogs and they all recommended this dish. I was not a fan though. Hehe! 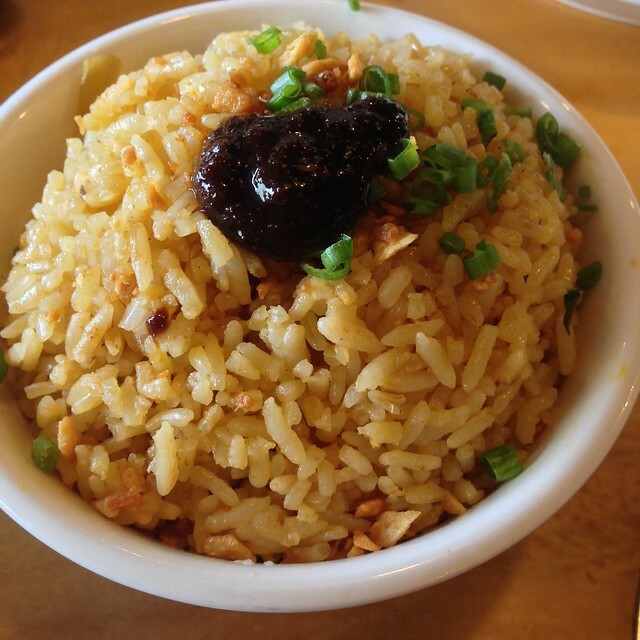 Ginamos Fried Rice, Php60. Good for one. Will be back to try more dishes with BOS, the one who's born in Negros. Heehee! 7th Ave cor 25th St. The first time I tried Saboten was at the Hong Kong International Airport four or five years ago. Three weeks ago, I took Y to Saboten in Glorietta 5. 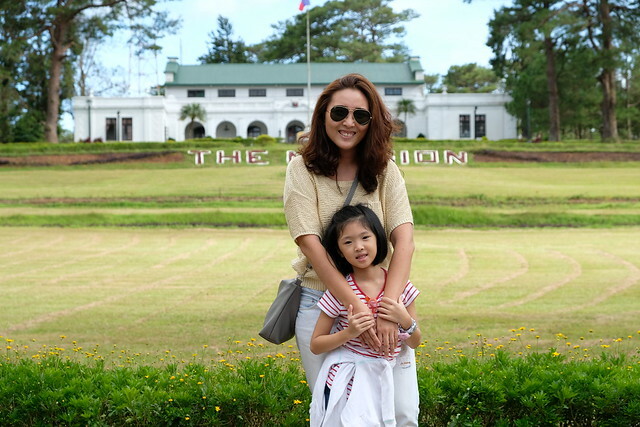 She has never tried tonkatsu and when she saw the menu, she said she didn't want to eat until she saw the kids' set. Hehe! Kids's Set (Php275) comes with one Tenderloin Cutlet (30g), one Crab Cream Croquette, French Fried Potatoes, and Orange Juice. 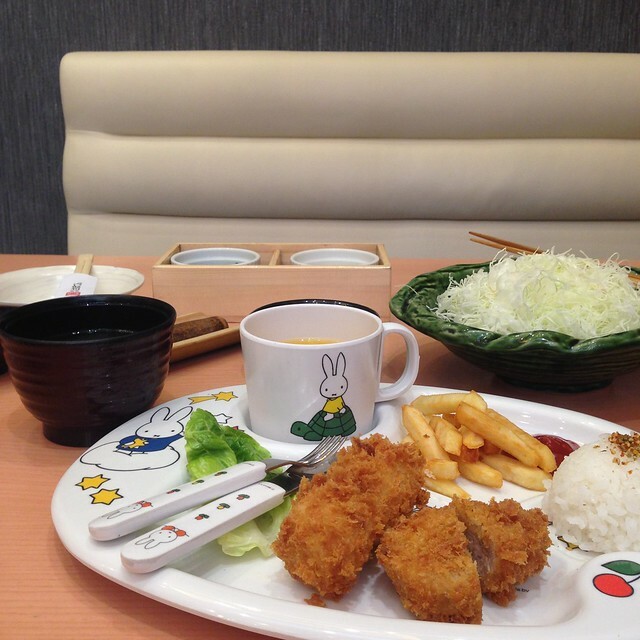 The Kids's Set also comes with unlimited Miso Soup and Cabbage Salad. She liked it! She said it's like nuggets! Hehe! The serving is just right for Y. I was still full from the food I ate earlier in school that day so I had the unlimited Cabbage Salad and Miso Soup and Y's leftovers (story of a mom's life). Hehe! 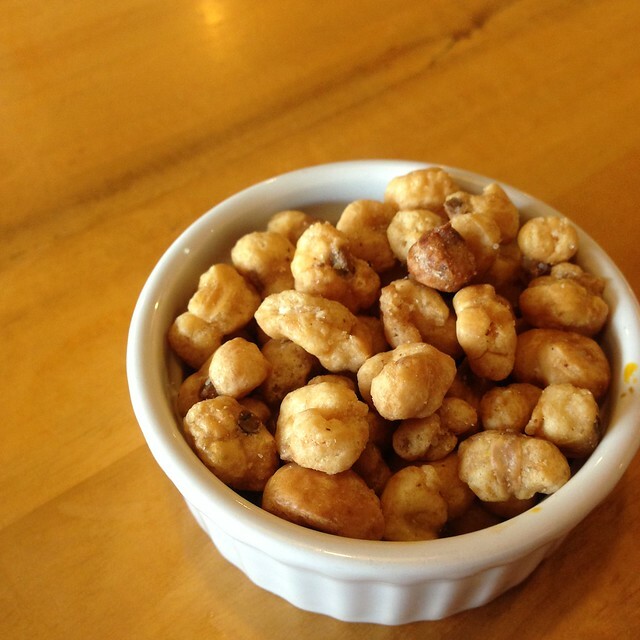 Saboten now goes to my list of kid-friendly restaurants. I know Y wants to go back too! I've attended events in Stacy's and food served was always great. But when I ate there on my own last year, I think I didn't order the right dish. I went back one Friday with Y, hoping I would order right dish this time. Charming place! I love the SMEG fridge and the bottles! 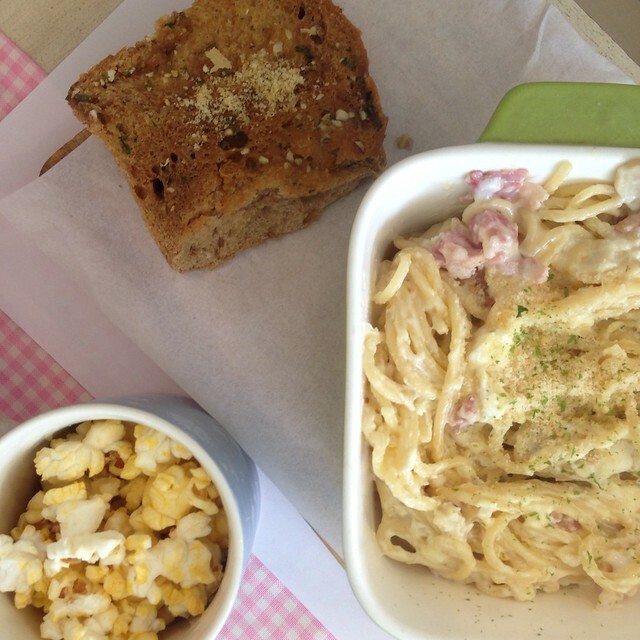 Bacon and Mushroom Carbonara, Php220. A pretty safe order for kids. A BTS of my IG post that day. I had the Stacy Jones, Php235. 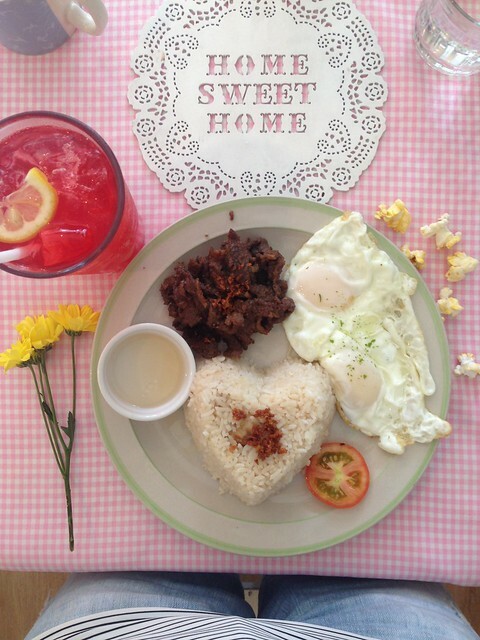 Tender yakiniku cut beef sirloin cut tapa with garlic rice and eggs. This time I got it right! I finished the whole thing. Hehe! 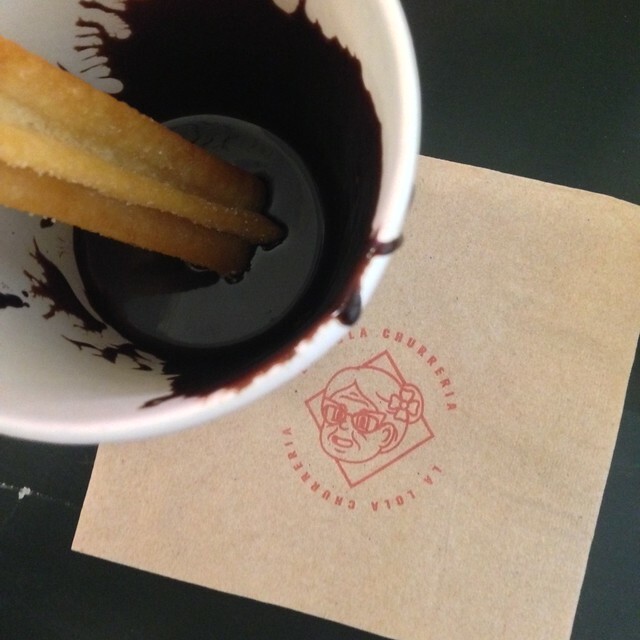 That ends another edition of my A&D Eats Round Up! Compiling another blog post soon. 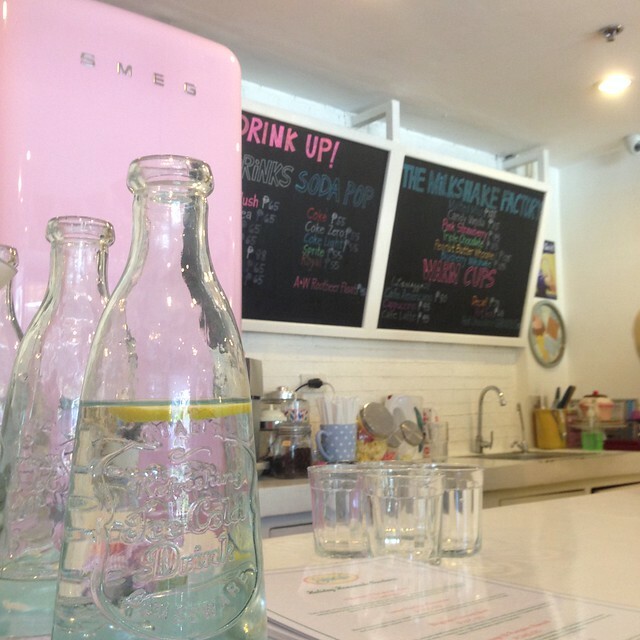 Meanwhile, you can check my other round up posts on: A&D Eats!